These homemade brownies with raspberry jam are a delight! 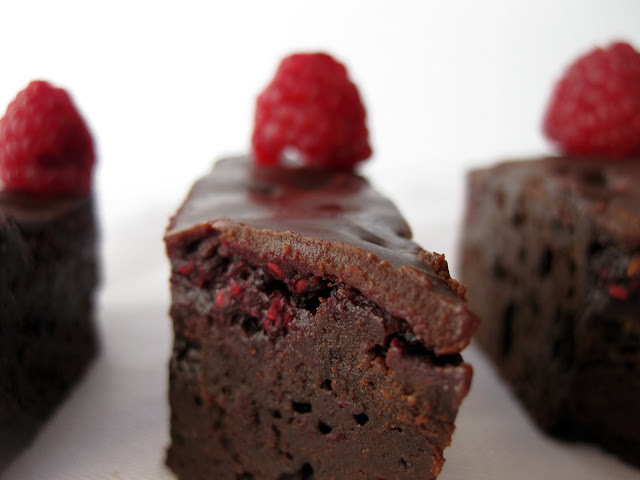 These Billion Raspberry Brownies are decadent and truffle-like . . . very rich, with a great raspberry taste. 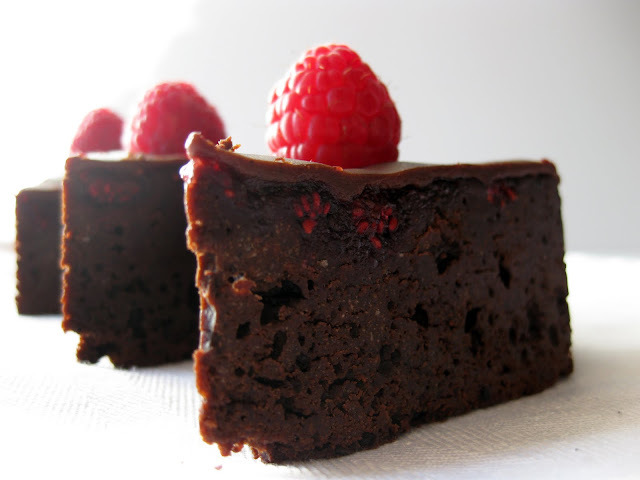 Beware, lovers of cake-y brownies: the raspberry truffle brownie will not be fluffy. Fudge-y by design, and downright gooey at their best, eat these raspberry-infused brownies and prepare to meet your demise. My apologies. A layer of chocolate ganache, a layer of raspberry jam, and raspberry-infused brownie batter = an amazing raspberry brownie. I've tried several homemade brownies in the last few weeks, and most of them have been very good. But few are as surprising and unique as brownies with raspberries. The first time I tried a raspberry brownie was a shared meal hosted by a friend. The recipe was a hand-me-down from a friend's mother, and I've had a copy of it ever since. This time, though, I've started with a recipe from Epicurious, and based on what I've learned from experience and my friend's mother's version, I've made several additions and modifications to boost both the chocolate and the raspberry flavors. These rich brownies with raspberry jam are some of the best raspberry brownies out there! Preheat the oven to 345°F. Combine sugar and eggs in a bowl. Beat for ~3 minutes on medium speed. Stir in vanilla. Melt chocolate and butter in a double boiler until melted, stir until smooth. Add instant coffee granules (intended to deepen the chocolate flavor, not to impart a coffee flavor). Stir to dissolve and combine. Allow to cool briefly (so as not to cook the eggs) and then combine with the sugar, egg, and vanilla mixture. Sift the flour, baking powder and cocoa together, add the salt, and combine with the wet ingredients. Mix until combined. Pour into 9in x 9in foil-lined and greased pan. Gently press the raspberries (fresh or frozen) into the batter. Bake for about 35 minutes or until set. These may take longer than 35 minutes to set, though don't let them go for too long: the longer you cook them the less fudge-y/truffle-y the raspberry brownies will be, and the more cake-y/dry they will get. Heat raspberry jam briefly in microwaveable bowl until melted and pourable, adding a teaspoon or two of water if necessary, stir, and pour on top of baked brownies. Spread into a thin layer. Heat cream in microwave or double boiler. Add chocolate and heat, stirring occasionally until chocolate is fully melted and smooth. Before the ganache fully cools, pour it carefully over the brownies, leaving some areas open so the jam and berries can show through (if you're into that). For more control, you can pour it into a pastry bag (or into a ziplock bag, and then cut the edge off). The ganache will harden as it cools. These are best if eaten in the first few days of baking. I've tried freezing them, but in my experience, it has a negative impact on quality. 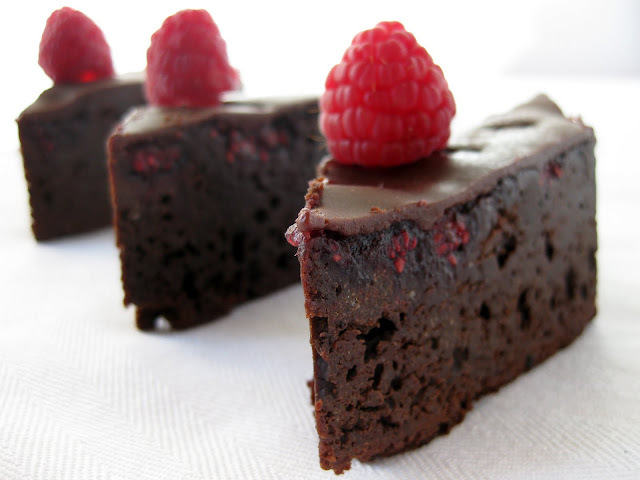 Enjoy your homemade brownies with raspberries!